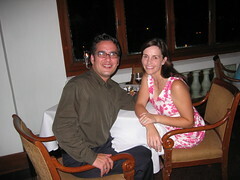 Today was our 6th Wedding Anniversary. The 6th is the Iron Anniversary. Jean gave me this beautiful iron desk lamp that must weigh 50 lbs. I bought her an antique iron made in Shanghai in the 1800s. We had dinner at the Verandah which is in our apartment complex. There was a Signal 3 Typhoon warning so we didn’t stray too far from home. 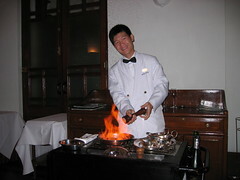 I had the “Repulse Bay Classic” menu that included a steak cooked in front of you by the gentleman in the picture below. Jean had lobster over angel hair pasta. I thought this was kinda cool. 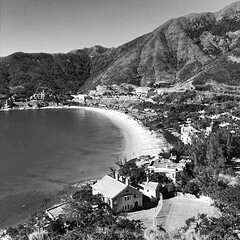 Below is a picture of Repulse Bay in 1947. The other picture is of Repulse Bay from last night. I download the older picture from a pretty cool website. Check out the link for some great photos of Hong Kong back in the day. Today is the Mid-Autumn Festival. It is celebrated on the full moon of the eigth lunar month. There are a lot of myths and stories about today including the eating of “mooncakes”. The story goes that Chinese revolutionaries planned to revolt against the government on the fifteenth of the eighth month. This message was passed around hidden in mooncakes amongst the people who subsequently rose up and overthrew the oppressive tyrant. If you get a chance to eat a traditional mooncake… don’t eat it. Mooncake. Sounds good doesn’t it. Sounds like a nice piece of cake. Well, the moon part of it is a preserved, salted, duck egg. Imagine leaving an egg out on your counter for a couple of months… hard-boiling it… throwing some salt on it… and sticking it in the middle of a piece of cake. 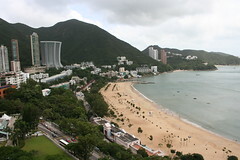 Anyway, people go to the beach and the park in Hong Kong and light lanterns and have picnic. We went downstairs to the beach with Grace along with her lanterns. She had a Butterfly lantern and an Imperial Rabbit lantern. Check out the link below to see our photo album from our Mid-Autumn Festival weekend. Check out the link below to see our photo album from our recent trip back to the U.S.A. There are pictures from Corolla, North Carolina, Chicago, Illinois, and Kalamazoo, Michigan. Over our family vacation in the Outer Banks, the Sawin/French/Obenauer family produced a Kung Fu movie called the Tower of Tonkatsu. The story is about a Kung Fu fighter who travels all the way from Hong Kong in search of some Tonkatsu (Japanese Pork Cutlet). The fighter has to fight her way up each level of the Tower to finally reach her goal.